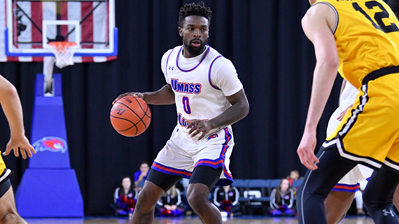 The UMass Lowell men’s basketball team (13-11, 5-4) picked up their program record 13th win of the season defeating the UNH Wildcats (19-5, 7-2) with a 72-62 score line. Redshirt guard Christian Lutete led the River Hawks with 18 points and 10 rebounds. Off the bench, senior guard Shawn Jones added 17 points while freshman forward Joey Glynn had 13 points and six rebounds. In the first ten minutes of this America East conference matchup, the visiting Wildcats could do whatever they pleased offensively. They even grabbed a quick six-point lead against the River Hawks. Ultimately the River Hawks picked up their first lead at the halfway mark of the first half way and never looked back. They would shoot 59 percent from the field in the opening half. Shawn Jones was putting on a show at Costello as he dropped 14 points in the first half shooting six for seven from the field. After a good defensive half, the River Hawks took a 44-32 lead in their first game playing without senior co-captain guard Ryan Jones and sophomore Obadiah Noel. Freshman guard Bryce Daley excelled in a starting role contributing 10 rebounds. The hosts would lock down the Wildcats offensively in 2nd half and force them to shoot 36 percent for the game. With Lutete and Daley both getting 10 rebounds, the River Hawks easily won the boards, 42-34. Freshman forward Joey Glynn would score 11 of his 13 points in the second half leading the River Hawks. With the River Hawks dominating on both sides of the floor and in the paint 34-22 for the game; they would seal the victory early into the second half. The hosts kept leading scorer Lutete and dependable senior forward Josh Gantz on the floor late on. Both players are coming off 40 minute performances this past Saturday against Vermont. The River Hawks will return to action this Saturday night as they begin their three game road trip against Stony Brook.